The Advocate asked the 14 new contestants on RuPaul's Drag Race season 6 about their first time in drag. RuPaul and the contestants of season 6 of RuPaul’s Drag Race celebrated the show’s Los Angeles premiere Monday at the Roosevelt Hotel. 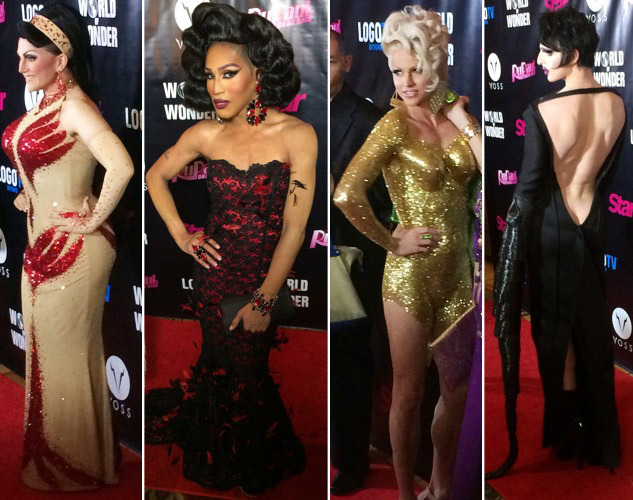 The historic Hollywood hotspot, which hosted the first Academy Awards, marked its own chapter in drag “herstory” with a screening of the season’s first episode, followed by drag performances from the fierce 14 competitors: Adore Delano, April Carrion, Ben De La Crème, Bianca Del Rio, Courtney Act, Darienne Lake, Gia Gunn, Joslyn Fox, Kelly Mantle, Magnolia Crawford, Milk, Trinity k. Bonet, Vivacious, and Laganga Estranja. They were cheered on by a host of celebrities who have appeared on the popular Logo show since its 2009 launch, including David Burtka, Lady Bunny, Bruce Vilanch, and Kelly Osbourne, who acted as host for the evening alongside Michelle Visage. In order to size up the competition, The Advocate spoke to RuPaul and the queens about their first experiences in drag as well as their thoughts on the upcoming season six, which premieres February 24 on Logo. Read their responses — and their red carpet looks — below. “The first time I ever dressed in drag was at a costume party during my childhood," says Courtney Act, wearing a gold ensemble that is literally painted on. "I went as Wonder Woman and my mom even took me to get the costume."